Travelodge new, accurate, sign. Just across from the underground station. 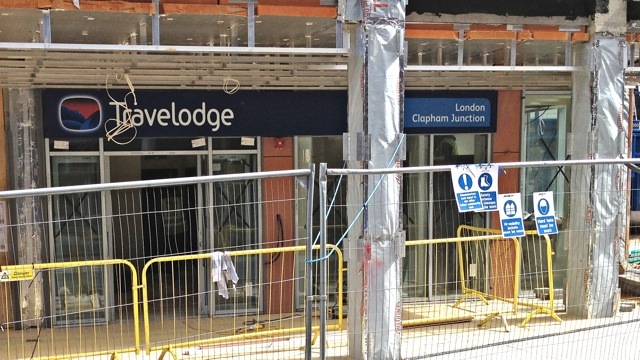 As Travelodge gets closer to completion they’ve started adding some signage, including one referring over its door naming it as ‘London Clapham Junction’. I’m not a Battersea fundamentalist, so I’m happy with that. I’ve no idea on the timescales involved in Travelodge signage, but would assume it was produced before my recent post on the subject: though it will reflect the efforts of the many people I know had already raised it with Travelodge. I cannot confirm when this decision will be made. This matter will be dealt with internally and so will not be communicated out. If the decision is made to change the name, the details will be changed on the website. If this is not changed then the decision has been taken to not make any changes. I think this is customer service done just right. It probably means they are just ignoring me, but the ‘we’ll think about it, but won’t tell you we’ve thought about it’ approach leaves me with just enough doubt that maybe, just maybe, they are grateful for my “valued feedback”. Their website (at the time of writing) still lists the hotel as ‘London Clapham’, and still has Clapham Junction on the underground; so maybe they’ve not decided yet. Or perhaps they have decided they are in Clapham, but because it was done internally they haven’t told anyone. Including their sign-makers.